I'm not a big fan of the Puritans, but there's a lot more than to them than Ann Hutchinson and witch trials, and I'm getting weary of people's facile ignorance about them. Historians are adopting a more generous view of Puritans; however, the Puritan contribution to American constitutionalism is often abstracted. There is a trend to focus on the 18th century writers and ignored the 17th century writings, focus on constitutional ideas and ignored constitutional institutions and legal structure, and divorce Puritan constitutional ideas from their explicit theological foundation. The idea of covenant, in particular, was a hugely important theological and social doctrine for the Puritans. The Puritans believed mankind had various covenants with God. Social covenants were based in the natural law, and one must voluntarily swear allegiance to the social covenant and live under the discipline of the community. Ecclesiastical covenants were covenants that called the church to preach the Gospel, administer the sacraments, and care for the poor and needy. Political covenants showed that God vested in the state temporal power of the sword. Thus, the state reflected and represented God’s majesty and authority. Church and state were therefore separate covenantal associations that had distinct callings and responsibilities. This was a very basic separation; the two covenants were not to be confounded, but they were still close and compact institutions that influenced one another. Due to the human nature of sin, Puritans also had strict limitations on the power of officials to prevent them from aiming for self-gain and self-indulgence. Puritans believed that officials should have as godly a character as possible, with a limited tenure in a limited government to prevent abuses. This doctrine led to a quasi-federalist form of government, with developed legal codes and strict statutes that laid out magistrate controls. Thus, the Puritan theology naturally led to a democratic form of government. "One of the little rhetorical tricks that the Christian nation apologists love to use is to point to the Puritans who settled the Plymouth Bay Colony and pretend that they founded the United States. But they didn’t. They created a brutal theocratic British colony that was repudiated by the Constitution." 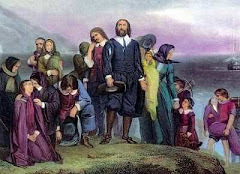 1) The Puritans did not found or settle Plymouth; the misnamed Pilgrim/Separatists did. 2) They did not create a theocracy (they were more tolerant of other faiths than the Anglican church). 3) If your reference about the Constitution is to Massachusetts, yes the federal gov't "repudiated" any national established church, John Adams' Mass. Constitution of 1780 retained the Congrgational church as the established church of the state (which lasted until 1833). But please, do not confuse Pilgrims with Puritans (read some works by Jeremy Bangs before you post anything else on this topic). JMS brings down the Hammer of Historical Accuracy. Ouch! BTW, Dr. Jeremy Bangs of the University of Leiden has stopped by in the past as a friend of the blog. JMS is certainly correct that "Pilgrim" and "Puritan" cannot be used interchangeably. To my own studies of what we term political theology hereabouts, as they're both Reformed/"Calvinist," they are close enough to speak of in the same breath. And though some such as our new friend Darryl G. Hart may dispute how authentically "Calvinist" Anglo-American Puritan thought really is, that’s their 21st century concern. Historically speaking, in the 1600s, it’s uniquely Calvinist, as opposed to Papist, Lutheran or Anglican, so there’s a Calvinist key to America that has been lost in the fog of time, and I've become convinced one cannot understand the American Founding without understanding Calvinism. Unfortunately, the only ones who "feel" Calvinism are either on the Religious Right or those who hate the Religious Right! Anyway, per the legal historian John Witte, the idea of a covenant with God interfacing with “social contract” is some sort of key to how the American political theology developed. It was not mere libertarianism-as-radical individualism. It’s best to imagine the Puritan/Calvinist colonies not as governments and nation-states, but as communities. The "nation-state" is a relatively new concept. The American Indians didn't have it, which is why they got the brown end of the stick when the Europeans came. Peoples must have geographical borders? Why? There's so few people and so much land!! I don't get it...! Tom - thanks for your support. Pilgrim experiences "in the cosmopolitan Netherlands are a reason they are less rigid or dogmatic in their views about what people must and must not do," argues Jeremy Bangs, curator of the American Pilgrim Museum in Leiden and author of "Strangers and Pilgrims, Travellers and Sojourners: Leiden and the Foundations of Plymouth Plantation," a 900-page reappraisal published this year on the 400th anniversary of the Pilgrims' arrival in Leiden. 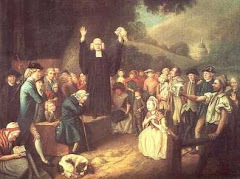 "The pilgrims didn't have witchcraft hysteria, they didn't kill Quakers. These are big differences!" notes Mr. Bangs, a former curator of Plimoth Plantation whose work draws heavily from untapped Dutch and New England archives. "Pilgrim leaders were less prone to persecute…. The possibility that others may be right and they may be wrong is something influenced by their time living in an extraordinary community of other exiles in Holland." It's always good to go for clarifying this period. I've always had a hard time keeping Puritan/Pilgrim and Plymouth/Massachusetts Bay Colony straight. "When he began working as a curator in Leiden’s municipal archives, Bangs admits he thought there was little left to learn about the Pilgrims. 'I had believed the prevailing views that they were rigid fanatics,' Bangs says. But as he followed the paper trail in the city’s records and other sources, a different picture emerged. 'They were much more tolerant than people think, particularly for their time,' he says. 'They did not require people in the Plymouth Colony to follow Calvinist beliefs. This led to a conscious construction of a society with separation of church and state.' Bangs, whose extensive research has made him one of the pre-eminent authorities on the Pilgrims, cites a 1645 proposal by the Plymouth Colony leaders that Jews, Catholics, Unitarians and many other sects be accepted in the Plymouth Colony." It seems to me that it was the Massachusetts Bay Colony, that apparently absorbed the Plymouth Colony, that was more theocratic/theonomic in its governance. This is likely the source of conflation? To be fair to Brayton, he is responding to initial claims by Michael Peroutka that may also be conflating Plymouth colony with Mass Bay Colony and Pilgrim and Puritan. Regardless, neither group founded a nation. And the express purposes of colonization were economic profits and future trade benefits. At least that's how the Company organizers, officers and shareholders likely saw it. Jimmiraybob - thanks for more Bangs - that Smithsonian article makes me want to visit Leiden someday.